On Monday tech site Thurrot reported that Spotify has begun rolling out a block feature, one which allows users to block artists from their view of the platform. When a Spotify user blocks an artist, they’ll no longer see them in curated playlists like Discover Weekly or even charts, and they’ll have to actively unblock the artist to hear their music again. The feature is reportedly only available through the mobile app for now, and for a small number of users. Spotify’s inclusion of a block button is clearly a response to the growing pressure of campaigns like #MuteRKelly, which has long called for R. Kelly to be removed from streaming services in response to the sexual assault and abuse allegations against him. Back in May Spotify tried to delicately solve the problem by removing both Kelly and the late rapper XXXTentacion (who was charged with battery of a pregnant woman before his death) from the platform’s playlists, but not the entire platform itself—only to walk back on the decision after artists cried censorship. There’s no easy institutional answer as to what to do with the music of men like R. Kelly, or XXXTentacion, or any other alleged abuser on a streaming platform like Spotify. While allowing users to answer that question on their own might seem like a great solution at first glance, it’s ultimately a lazy, patronizing copout for Spotify, one which allows the streaming giant to avoid answering for their role in promoting these artists. Putting the question of what to do with these artists in the hands of the individual seems to suggest that bad behavior, even criminal abuse, is simply a question of taste, just like any other choice users make on the platform. You don’t like country? Block it! You don’t like men who beat their girlfriends? Block it! One in the same, right? The button implies that all anyone really wants is to not see or hear abusers in their own time—rather than hold sprawling systems like record labels, streaming platforms, and publications widely responsible for deifying and financially supporting these artists. A simple mute button ignores protestors’ larger goal, which is not just for the muting of individual artists, but for the systems that support them to think critically about their actions. What good is a blindfold to reality when the charts still show these men climbing? While artists barely make money off Spotify streams, what is important for rising artists is playlist placements. Most people who use Spotify are listening to music via those playlists, which is why the company has invested so much time and money in curation. The careers of young rappers like XXXTentacion and 6ix9ine (whose music was not removed as part of the policy, but the artist plead guilty to “the use of a child in a sexual performance”) have been undoubtedly boosted by placements on Spotify’s Rap Caviar playlist, a deeply influential and popular playlist that can essentially make or break a young rapper. There have been enough glossy profiles of these in-house playlist creators to know that Spotify editorializes music through its playlists and recommendations. It’s in those corners of the platform, where fans listen to music the most, that the company needs political reform. Rather than giving users the option to mute artists, they should first take a look at who they’re inadvertently “muting” in their own branded playlists (spoiler alert, it’s women.) Spotify can posture all they want about their progression on the front-end, but it’s the back-end of their business that needs work. Though of course, they won’t get a quick press release out of that. What Spotify’s forthcoming block feature reveals is the big, gaping hole in the company’s approach to streaming and music in general. Spotify does not treat music like art, but as a universally noncontroversial product that can be neatly organized by genre, sound, or situation. To them, they may as well be organizing Skittles into colorful piles. 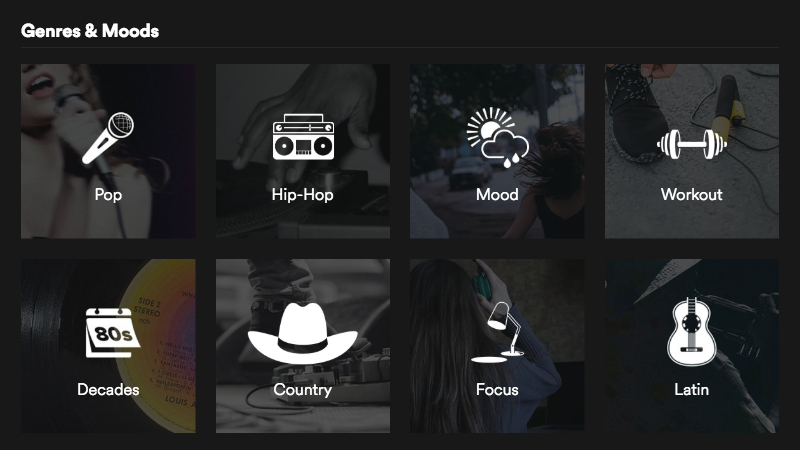 In 2015 Spotify published data that supported the idea that users prefer to listen to music in “contexts” rather than genres, i.e. “chilling” or “partying.” They concluded that “context was the new genre” and ever since then Spotify has invested heavily in playlists that, as writer Liz Pelly reports, promote “lean back listening.” The typical Spotify user just puts on a playlist designed by the platform and listens to whatever they’re given—which only makes Spotify more accountable for who they’re putting on these playlists. To Spotify, music is best when it’s malleable, when it’s easy. But music (and it feels ridiculous to type this out, but here we are) has undeniable political and social baggage, just like any other art form. Watching Spotify flail over what to do exactly with music that has a cultural reach beyond the literal noise coming out of your computer screen emphasizes not just the limitations of the platform, but their entire approach to music in general. Spotify can pretend all it wants that music is just something to play during a pool party, or while you’re doing your dishes, or sleeping. But as long as it does, it will be failing its users.